Not every 30 degree F day will be sunny while cold but on the very many occasions that the two converge, the boat owner of a TEPS boat (Totally Electric Powered Solar) boat gets an even greater saving on the heating bill. inside, so not much electric heat is needed. In essence, by combining the solar gain through the large expanse of windows and the sun pouring down on the solar electric collecting roof, the warm window light and electric heater make a very cozy space. to assist the heat gain from the windows & sun. 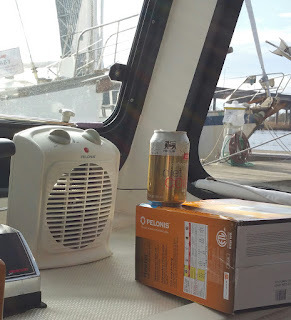 In fact, as the day goes on, the electric heater used in the early morning is switched off (the saloon gets too hot at 80 degrees). The sun streaming in the windows does the warming all by itself. As a side note, that very same heat in the summer is blocked over 90% by an exterior silver mylar shade, allowing a small AC unit to keep the interior cool (reported in the June 4, 2015 blog). ordered as it is not always stocked in store. 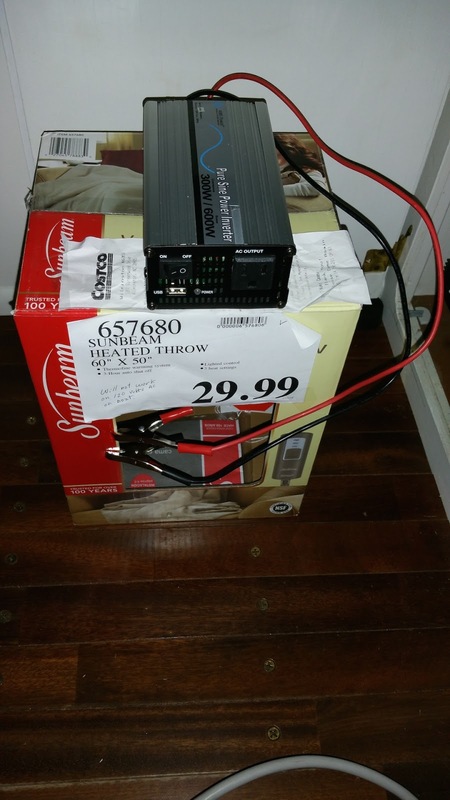 battery bank #2 at 25.7 volts, just so neat. The above demonstration is of a sunny day event on a 35 degree F day. If there is sunshine coming into the boat, the amount of auxiliary heat is a fraction of what would be needed in a standard trawler or cruiser. Nothing worse than making it nicely through a cold day, only to be refrigerated in bed. 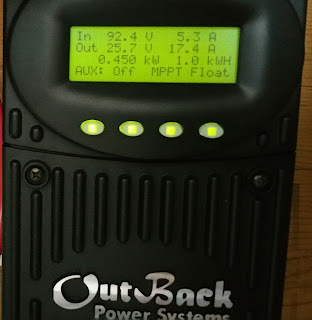 You can't have a warm electric blanket, at night, with no sun on a solar electric boat, right? WRONG!!! The sun has been stored as chemically converted energy in batteries and awaits serving any need (within reason) you desire, in this case warmth through the cold night. the lights were turned off. That is a darn cold test. 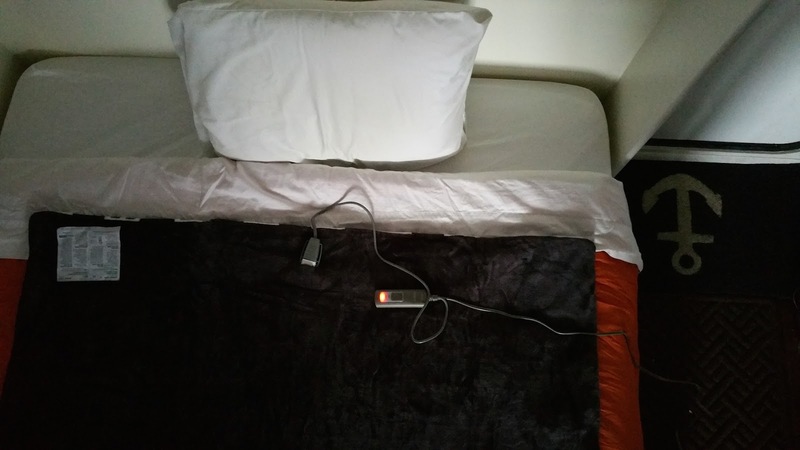 A well made Sunbeam electric blanket with a computer controlled thermostat is just the ticket to a snuggly nights sleep. Emphasis here though is on computer controlled. That will require a pure sine wave (as in home type outlet) 120 volts of A-C current. That leaves out the modified sine wave inverters. (to be hard wired in the electrical cabinet). 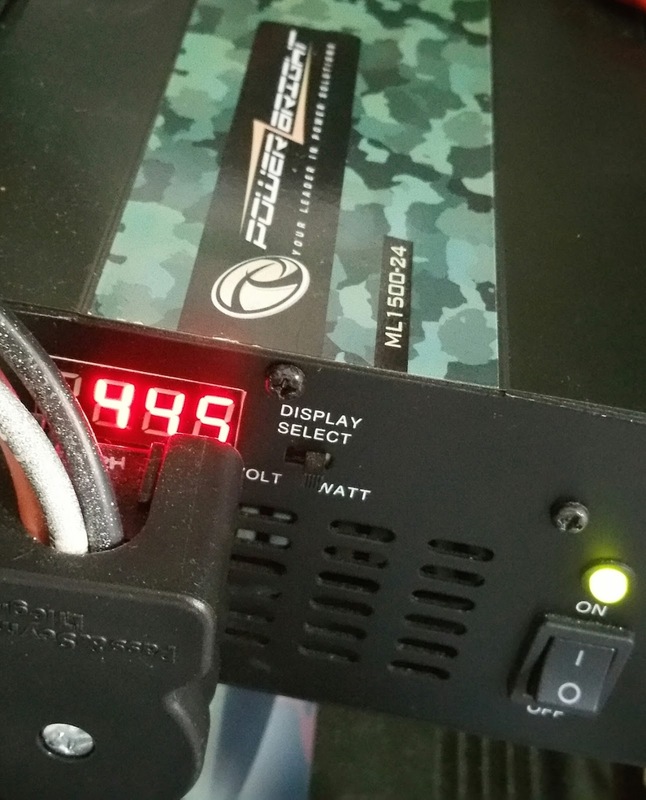 A new toy on board is an Aims pure sine wave 300W inverter. Why such a puny inverter wattage? 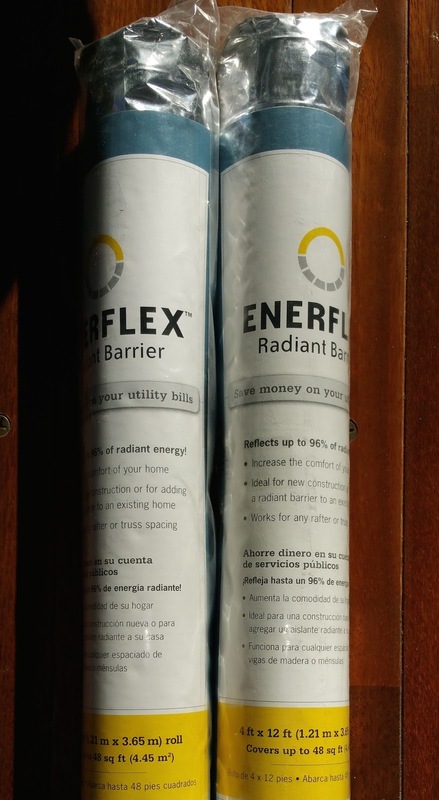 Because if you do not need the extra wattage... why pay extra money? 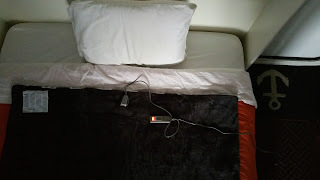 What most folks do not know is that electric blankets use very low wattage, in this case between 40 and 160 watts. That's all folks. All the better, the sine unit connects directly to the 24 volt DC battery bank (yes it is fused) and has an outlet that is great for the blanket, computers, cameras, phones and the radio control chargers. picture to enlarge the view and text. Warm story short, the sub 32 degree F night was very warm indeed and left the battery bank full above its 24 volt level the next morning. The blanket had to be layered differently at about 0100 hrs because it was on the lowest setting and still too warm. Once moved to a level above the comforter, it was no longer in such near contact to my body, working flawlessly. 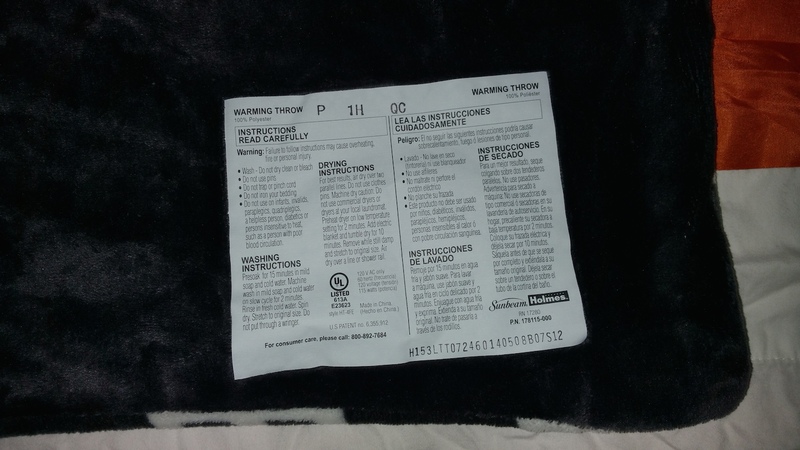 Please remember to never sit or lay on an electric blanket because the wires inside are not strong enough to resist weight concentrations of hips and shoulders. The unit will prematurely fail... no fire, just fail to heat properly. 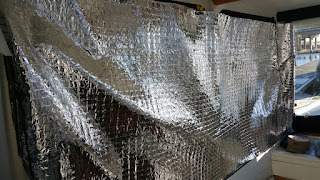 A note here is the Mylar/aluminum foil that will be used for curtain backing for both inside or outside application. Just testing the very strong foil as it was draped inside the saloon on the non-sunny side. 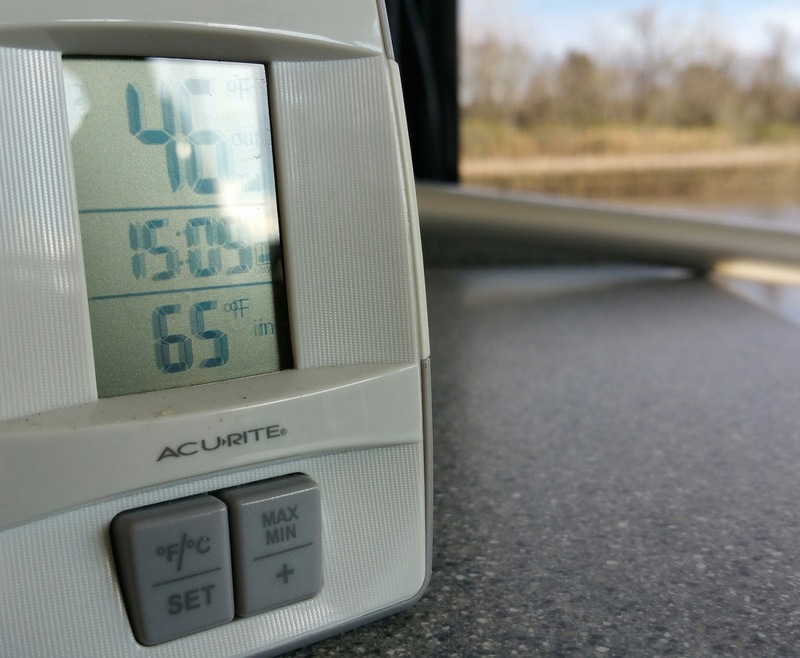 With the heated air from sun through the large windows, the temperature rose in about a half hour from 40 degrees to 65and about 15 minutes later to 75.
the port side as it zips past 65 interior. 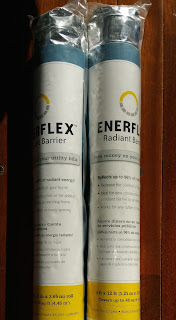 The Mylar film reflects close to 96% of the solar heat back into the room. It was taken down soon after at 80 degrees. The high was 40 degrees outside with the temperature in the bilge at 46. There is nothing exotic here, just common sense applied to currently available consumer technology. All of these elements can be seamlessly integrated into a clean design but for now this is a wonderful and physical playground for the inventive mind of MOG.